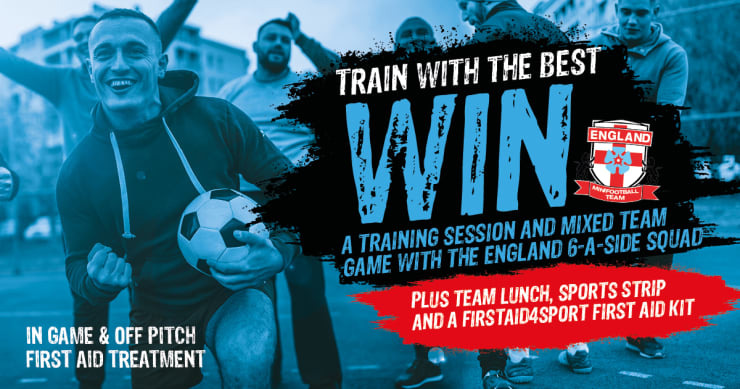 Fancy winning a training day for you and your team, with England’s 6-a-side Head Coach and the 6-a-side squad? 10 runners up will receive a team football, a first aid kit and one pair of Glove glu goalkeeper glove care system pack. Simply fill in the form below, and don’t forget to LIKE the Alfasilver Facebook page to complete your entry! Competition closes Sunday 27th January 2019 – GOOD LUCK! A shortlist of entrants will be randomly selected and contacted via email to inform them that they have been shortlisted and ask them to gain votes to become the winning team. The size of the shortlist will depend on the number of entrants to the competition and will equate to approximately 50 of the entrants of the competition as a whole. Entrants must then submit their team photo which will be shared on the Alfasilver Facebook page, they will then share this post to gain likes on their team photo. The team with the most likes on the competition closing date will win the first prizes of the training session and mixed game with the England Socca team, the runners up (runners up being defined as the 10 teams with the most votes beside the winner) will receive runner up prizes of free first aid kits for their teams. This competition is in no way sponsored or administered by Facebook. The information you provide will only be used for this competitions purposes and will not be shared. To read the competition T&Cs on the Alfasilver website, please click here.